Americans are the world's biggest water consumers. By 9 a.m., after showering, using the bathroom, brushing our teeth and having a cup of coffee, each of us typically has used more than 30 gallons of water. After doing the dishes - 12 gallons per load - running the washing machine - 43 gallons per load - and watering the lawn - 10 gallons per minute - by the time we go to bed, we've used up to 150 gallons. By comparison, people in the U.K. use a quarter of that - 40 gallons of water a day. The Chinese average just 22 gallons per day. 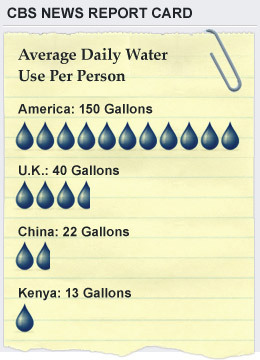 And in the poorest countries like Kenya, people use less than the minimum 13 gallons to cover basic needs. "Water is overtaking oil as our scarcest natural resource in the world," said Steven Solomon, author of the new book "Water: The Epic Struggle For Wealth, Power, and Civilization." "And even we're going to find, in the United States as well." Scientists have never measured the exact amount of water available in the U.S., but they're concerned enough that they've just launched a new government study to find out. Experts do agree: Demand is greater than supply. And 36 states face water shortages in the next three years. Every day Arizona and parts of New Mexico use 300 million gallons more than they get in renewable supply. The extra comes from underground supplies which are not renewable. How much water's underground? When could it run out? No one knows. And clearly that is a problem. Nowhere is America's water crisis more evident than Lake Mead, just outside Las Vegas. The city has 2 million thirsty people - and gets 90 percent of its drinking water from the lake. This area has grappled with a decade of drought. All last year it rained two inches, half its normal total. "It's the driest city in the United States; it's definitely at the crisis level," said Pat Mulroy of the Southern Nevada Water Authority. When full, Lake Mead could cover all of Pennsylvania under a foot of water. But since 1998, the lake's capacity has plunged more than half, down 5.6 trillion gallons, enough to supply the entire United States for about six months. Locals call the white band on the canyon walls the "bathtub ring." It's a mineral residue left behind by Lake Mead's sinking water. It's more than 130 feet high all around the lake. It's a reminder how deep the water problem really is. More on "Where America Stands"
Gail Kaiser's family has owned a marina at Lake Mead since 1957. But in 2002, water levels were so low, the marina's docks were landlocked. "It was a wake-up call," Kaiser said. "We lived here for a long time, and you don't think those things are going to happen." Kaiser said their original water line is a thousand feet from the water's new edge. Since then, they've moved 15 more times, and later this month, the marina will have to move again. Four miles from the marina, the Hoover Dam supplies hydro-electric power to two million homes and businesses in Nevada, Arizona and California. But without enough water pressure from the lake, the massive generator units there will stop turning. As manager, Ken Rice checks the lake's level every day. There's a point below which the lake cannot go. "From a power generation standpoint, our main concern would be an elevation of about 1,050," he said. The lake's elevation has plunged to 1,095 feet, just 45 feet above the point that worries Rice. America needs solutions to its water worries. Las Vegas has aggressive water conservation programs. Seventy percent of this desert community's water use is outdoors. So the local water authority pays homeowners to rip out their lawn and replace it with desert-friendly landscaping. Las Vegas also hired water police to patrol and issue fines to water violators. On the Vegas strip, City Center is the new jewel, $8 billion of environmentally-friendly luxury including low-flow water fixtures, slashing water use by more than one hundred million gallons a year. The city's efforts seem to be paying off. From 2002 to 2008, the city boomed: 400,000 more people moved in. But water consumption dropped by 20 billion gallons. Other regions are trying other solutions. Coastal states have built more than 200 desalination plants. By next year, San Diego's new one could convert 50 million gallons of ocean water a day into drinking water. Eight states surrounding the Great Lakes are trying to hold on to what they have. They signed a pact banning the export of water to outsiders, even other U.S. states. But water experts agree: Conservation is America's best hope. "Everyone has a piece of the responsibility," Mulroy said. "It is our individual behaviors." Behaviors that are now slowly starting to change as Americans learn the real worth of water.